Graphene, a sheet of carbon atoms bound together in a honeycomb lattice pattern, is hugely recognized as a “wonder material” due to the myriad of astonishing attributes it holds. It is a potent conductor of electrical and thermal energy, extremely lightweight chemically inert, and flexible with a large surface area. It is also considered eco-friendly and sustainable, with unlimited possibilities for numerous applications. In the field of batteries, conventional battery electrode materials (and prospective ones) are significantly improved when enhanced with graphene. A graphene battery can be light, durable and suitable for high capacity energy storage, as well as shorten charging times. It will extend the battery’s life, which is negatively linked to the amount of carbon that is coated on the material or added to electrodes to achieve conductivity, and graphene adds conductivity without requiring the amounts of carbon that are used in conventional batteries. Graphene can improve such battery attributes as energy density and form in various ways. Li-ion batteries (and other types of rechargeable batteries) can be enhanced by introducing graphene to the battery’s anode and capitalizing on the material’s conductivity and large surface area traits to achieve morphological optimization and performance. It has also been discovered that creating hybrid materials can also be useful for achieving battery enhancement. 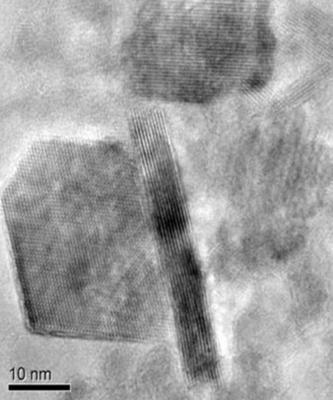 A hybrid of Vanadium Oxide (VO2) and graphene, for example, can be used on Li-ion cathodes and grant quick charge and discharge as well as large charge cycle durability. In this case, VO2 offers high energy capacity but poor electrical conductivity, which can be solved by using graphene as a sort of a structural “backbone” on which to attach VO2 - creating a hybrid material that has both heightened capacity and excellent conductivity. 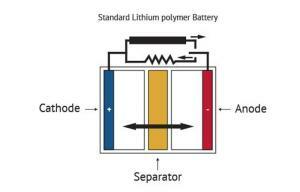 Another example is LFP ( Lithium Iron Phosphate) batteries, that is a kind of rechargeable Li-ion battery. It has a lower energy density than other Li-ion batteries but a higher power density (an indicator of of the rate at which energy can be supplied by the battery). Enhancing LFP cathodes with graphene allowed the batteries to be lightweight, charge much faster than Li-ion batteries and have a greater capacity than conventional LFP batteries. In addition to revolutionizing the battery market, combined use of graphene batteries and graphene supercapacitors could yield amazing results, like the noted concept of improving the electric car’s driving range and efficiency. While graphene batteries have not yet reached widespread commercialization, battery breakthroughs are being reported around the world. Batteries serve as a mobile source of power, allowing electricity-operated devices to work without being directly plugged into an outlet. While many types of batteries exist, the basic concept by which they function remains similar: one or more electrochemical cells convert stored chemical energy into electrical energy. A battery is usually made of a metal or plastic casing, containing a positive terminal (an anode), a negative terminal (a cathode) and electrolytes that allow ions to move between them. A separator (a permeable polymeric membrane) creates a barrier between the anode and cathode to prevent electrical short circuits while also allowing the transport of ionic charge carriers that are needed to close the circuit during the passage of current. Finally, a collector is used to conduct the charge outside the battery, through the connected device. When the circuit between the two terminals is completed, the battery produces electricity through a series of reactions. The anode experiences an oxidation reaction in which two or more ions from the electrolyte combine with the anode to produce a compound, releasing electrons. At the same time, the cathode goes through a reduction reaction in which the cathode substance, ions and free electrons combine into compounds. Simply put, the anode reaction produces electrons while the reaction in the cathode absorbs them and from that process electricity is produced. The battery will continue to produce electricity until electrodes run out of necessary substance for creation of reactions. Batteries are divided into two main types: primary and secondary. Primary batteries (disposable), are used once and rendered useless as the electrode materials in them irreversibly change during charging. Common examples are the zinc-carbon battery as well as the alkaline battery used in toys, flashlights and a multitude of portable devices. Secondary batteries (rechargeable), can be discharged and recharged multiple times as the original composition of the electrodes is able to regain functionality. Examples include lead-acid batteries used in vehicles and lithium-ion batteries used for portable electronics. Batteries come in various shapes and sizes for countless different purposes. Different kinds of batteries display varied advantages and disadvantages. Nickel-Cadmium (NiCd) batteries are relatively low in energy density and are used where long life, high discharge rate and economical price are key. They can be found in video cameras and power tools, among other uses. NiCd batteries contain toxic metals and are environmentally unfriendly. Nickel-Metal hydride batteries have a higher energy density than NiCd ones, but also a shorter cycle-life. Applications include mobile phones and laptops. Lead-Acid batteries are heavy and play an important role in large power applications, where weight is not of the essence but economic price is. They are prevalent in uses like hospital equipment and emergency lighting. Lithium-Ion (Li-ion) batteries are used where high-energy and minimal weight are important, but the technology is fragile and a protection circuit is required to assure safety. Applications include cell phones and various kinds of computers. Lithium Ion Polymer (Li-ion polymer) batteries are mostly found in mobile phones. They are lightweight and enjoy a slimmer form than that of Li-ion batteries. They are also usually safer and have longer lives. However, they seem to be less prevalent since Li-ion batteries are cheaper to manufacture and have higher energy density. While there are certain types of batteries that are able to store a large amount of energy, they are very large, heavy and release energy slowly. Capacitors, on the other hand, are able to charge and discharge quickly but hold much less energy than a battery. The use of graphene in this area, though, presents exciting new possibilities for energy storage, with high charge and discharge rates and even economical affordability. 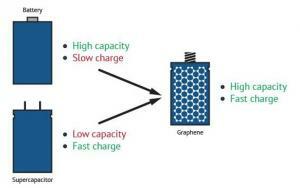 Graphene-improved performance thereby blurs the conventional line of distinction between supercapacitors and batteries. Graphene-based batteries have exciting potential and while they are not yet fully commercially available yet, R&D is intensive and will hopefully yield results in the future. In December 2018, India-based Log 9 Materials announced that it is working on graphene-based metal-air batteries, that in theory may even lead to electric vehicles that run on water. The metal air batteries use a metal as anode, air (oxygen) as cathode and water as an electrolyte. A graphene rod is used in the air cathode of the batteries. Since Oxygen has to be used as the cathode, the cathode material has to be porous to let the air pass, a property in which graphene excels. According to Log 9 Materials, the graphene used in the electrode is able to increase the battery efficiency by five times at one-third the cost. In November 2017, Samsung developed a unique "graphene ball" that could make lithium-ion batteries last longer and charge faster. In fact, Samsung Advanced Institute of Technology (SAIT) said that using the new graphene ball material to make batteries will increase their capacity by 45% and make their charging speed five times faster. It was also said that the Samsung battery that will use this graphene ball material will be able to maintain a temperature of 60 degrees Celsius that is required for use in electric cars. In November 2016, Huawei unveiled a new graphene-enhanced Li-Ion battery that can remain functional at higher temperature (60° degrees as opposed to the existing 50° limit) and offers a longer operation time - double than what can be achieved with previous batteries. To achieve this breakthrough, Huawei incorporated several new technologies - including an anti-decomposition additives in the electrolyte, chemically stabilized single crystal cathodes - and graphene to facilitate heat dissipation. Huawei says that the graphene reduces the battery's operating temperature by 5 degrees. 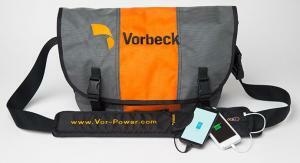 In June 2014, US based Vorbeck Materials announced the Vor-Power strap, a lightweight flexible power source that can be attached to any existing bag strap to enable a mobile charging station (via 2 USB and one micro USB ports). the product weighs 450 grams, provides 7,200 mAh and is probably the world’s first graphene-enhanced battery. In May 2014, American company Angstron Materials rolled out several new graphene products. The products, said to become available roughly around the end of 2014, include a line of graphene-enhanced anode materials for Lithium-ion batteries. The battery materials were named “NANO GCA” and are supposed to result in a high capacity anode, capable of supporting hundreds of charge/discharge cycles by combining high capacity silicon with mechanically reinforcing and conductive graphene. Developments are also made in the field of graphene batteries for electric vehicles. Henrik Fisker, who announced its new EV project that will sport a graphene-enhanced battery, unveiled in November 2016 what is hoped to be a competitor to Tesla. However, the Fisker battery was later announced to not rely on graphene. In August 2014, Tesla suggested the development of a "new battery technology" that will almost double the capacity for their Model S electric car. It is unofficial but reasonable to assume graphene involvement in this battery. Many other companies are also working on incorporating graphene into various kinds of batteries, for more information we recommend reading our Graphene Batteries Market Report. Lithium batteries' tendency to occasionally catch on fire (an occurrence known as “thermal runaway”) is well documented, and may occur when the batteries overheat or cycle rapidly. Researchers from the University of Illinois at Chicago College of Engineering report that graphene may help with this disturbing issue. Conditions such as rapid cycling or charging and discharging, and high temperatures in the battery can cause the cathode inside the battery — which in the case of most lithium batteries is a lithium-containing oxide, usually lithium cobalt oxide — to decompose and release oxygen. If the oxygen combines with other flammable products given off through decomposition of the electrolyte under high enough heat, spontaneous combustion can occur. 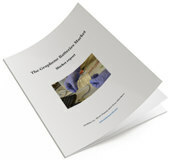 Today we published new versions of all our graphene market reports. 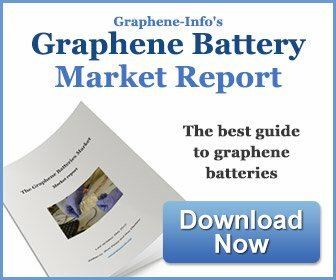 Graphene-Info provides comprehensive niche graphene market reports, and our reports cover everything you need to know about these niche markets. The reports are now updated to April 2019. 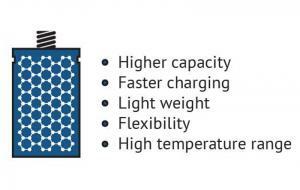 The report package provides a good introduction to the graphene battery - present and future. 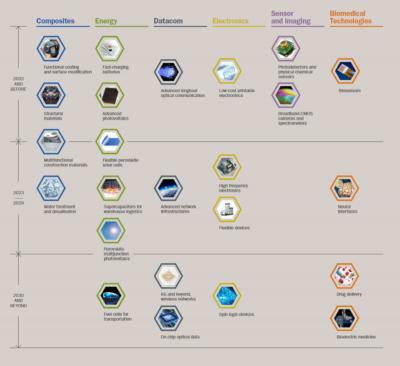 It includes a list of all graphene companies involved with batteries and gives detailed specifications of some graphene-enhanced anode materials and contact details into most graphene developers. Read more here! Talga Resources has revealed new test results on the ongoing optimization of its graphene silicon Li-ion battery anode product, Talnode™- Si. According to Talga, the battery anode product returns further performance gains, now delivering ~70% more energy density than commercial graphite-only anodes. The product reportedly provides a “drop in” solution for improving current Li-ion battery performance. Commercial samples under confidentiality and material transfer agreements are scheduled to commence delivery around the end of February 2019 - recipients are said to include some of the world’s largest electronic corporations. 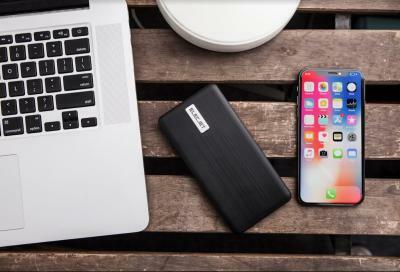 Elecjet, developer of USB C PD and Graphene Battery technology for fast charging, will be launching a Kickstarter campaign on February 13th, for its Apollo Traveler: an advanced graphene-enhanced USB-C / A fast charging power bank. The company explained that the Apollo Traveler uses graphene layers to cover the negative pole and positive pole to achieve a smaller internal resistance and better conductivity. Elecjet also stated that it "reinforced graphene composite layers inside the power bank, making overheating issues a thing of the past". The graphene for the battery is provided by CellsX.